No words can describe the horror and tragedies the Yemenis have been enduring for more than three years. Isn’t it time for the people of Yemen to be freed from the Houthis’ hands tampering with their fate, drowning them in poverty and nescience? Will we see in the near future the Houthis fleeing Sanaa? Or will calm prevail to pave the way for UN-backed peace talks? Famine and drought are killing the people of Yemen. All Yemeni social strata, especially the poor, have been suffering endlessly the repercussions of war. The Houthis are a poisonous thorn in the side of Yemen. Western calls to stop the war have been renewed. US Secretary of State Mike Pompeo invited warring parties in Yemen to cease the violence and negotiate a peaceful solution to the conflict with UN Special Envoy to Yemen Martin Griffiths. Griffiths had promised in late October the war in Yemen would end within 30 days. His promise lacked any serious initiative. In addition, it was found this week that humanitarian food aid packages were mixed with arms at Hodeida Port. Violence intensified after a relative calm. People are rising up against Houthi torture, bulling for money, selling food aid packages and kidnapping youth and children to force them to fight. Today, the Houthis are suffering deep divisions within their ranks after a number of senior officials and ministries no longer stand on the Houthis’ side when they realised the end was probably near. 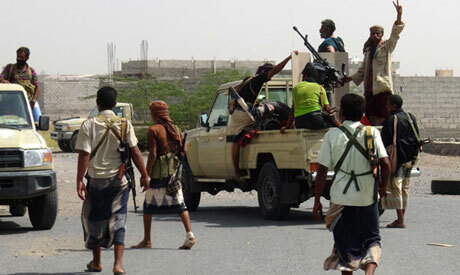 Yemeni sources in Sanaa reported Houthi militias have intensified their security measures, tightening control on a number of figures after Information Minister in the Houthi government Abdul-Salam Gaber and Deputy Education Minister Abdullah Al-Hamdi fled Sanaa to Riyadh, Saudi Arabia. Sources added the Yemenis have had it with the Houthis’ methods of starvation and backwardness. When Yemenis refused to attend a sermon by strongman Abdul-Malek Al-Houthi, the speech was broadcast through loud speakers in mosques in a show of disregard. The Houthis’ arbitrary measures resulted in the militias’ killing of a Yemeni vendor who was selling qat (or khat, a leaf that is chewed) to feed his children. The vendor’s tribal relatives headed to the checkpoint where he was killed, kidnapped five Houthi militiamen and led them to an unknown place. The Houthis’ violations against civilians and travellers at checkpoints erected between governorates and directorates under Houthi control are despicable. But the world is finally waking up to the catastrophe engulfing Yemen. Last week, US newspapers wrote about the death of Yemeni children as a result of famine. The Guardian added: “The World Health Organisation warned last month that reports of cholera were running at 10,000 cases a week.” Other estimates put the figure at five-fold that number. “Violence has intensified since the unexpected US call for a ceasefire last month. With fighting flaring in the critical port of Hodeida this week, the UN envoy delayed planned talks until the end of the year,” the newspaper continued. UK Foreign Secretary Jeremy Hunt is scheduled to fly to Saudi Arabia and the United Arab Emirates to work towards ending the war in Yemen. His office said Monday that Hunt has urged action on the part of the UN Security Council to stop the bloodshed, famine and disease. “The human cost of war in Yemen is incalculable: with millions displaced, famine and disease rife and years of bloodshed, the only solution now is a political decision to set aside arms and pursue peace,” said Hunt. Yemen’s army forces liberated new positions from the Houthi militia in the city of Hodeida, west of country, last week. On Monday, chief of operations of the Second Brigade Al-Amalikah, Ahmed Al-Jaheli, told September Net news site that army forces engaged in fierce battles with the Houthis in Rabsa neighbourhood, succeeding in taking hold of Al-Nagah School and nearby buildings. Al-Jaheli stressed the army was still advancing in the depths of Rabsa. Sunday morning witnessed heavy artillery shelling and Apache helicopters belonging to the coalition led by Saudi Arabia raided the Houthis that attempted to attack army locations. Yemeni sources report the country is engulfed in “entire chaos”. Amid the military escalation in Hodeida and US and European calls to stop the war and end the humanitarian crisis, with US President Donald Trump describing Yemen as the worst place in the world, will the bloodshed continue? Will peace talks ensue to end the suffering of millions of Yemenis? This country’s crisis threatens to stretch its roots to the region and the rest of the world. Who is holding the cards of war and peace to end the suffering of Yemenis? Has the UN presented a roadmap to end the war, or is it releasing void statements? Will dividing Yemen to autonomously controlled areas provide the solution? Will the Yemenis agree to this to achieve peace? The world’s worst humanitarian crisis may end with national rapprochement or military intervention. Either way, within the coming month the deteriorating conditions of a nation living in the shadow of death have to stop.